Lake Superior Log Home Retreat - Welcome! 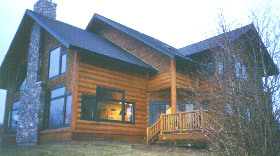 Our log home condo has three bedrooms including a large main floor bedroom with queen-size bed, full bathroom and Jacuzzi tub with lake view, two upstairs bedrooms; one a master bedroom with queen-size bed, lake view, Jacuzzi tub, full bathroom and gas fireplace, wet bar, sink and refrigerator, plus small table and chairs. The second bedroom contains a queen-size bed, a single bed and full bathroom. We have a full-size kitchen, a bar with three stools and a dining area that will seat eight. Our living room features a wood burning fireplace, leather chairs, entertainment center, a sleeper sofa and a beautiful view of Lake Superior. Open the windows and hear the waves. A sliding door in the dining area opens out on to a small deck which contains a gas grill and patio furniture. Steps from the deck allow easy access to the beach. The upstairs and downstairs may be rented separately. The following items are supplied for your use; refrigerator/freezer, electric stove and oven, microwave, plates and glassware, pans, cooking utensils, silverware, coffeemaker and coffee, toaster, popcorn popper, George Foreman grill, blender, dishwasher, T.V. and VCR/DVD, wireless internet connection is now available. In each bedroom cable, telephone which may be used with calling cards ONLY unless calling locally, movies, games, towels, sheets and blankets and shower and bath tub soap. 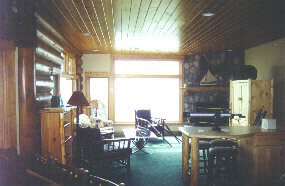 Our log home retreat is a condo in the Grand Superior Lodge Association. 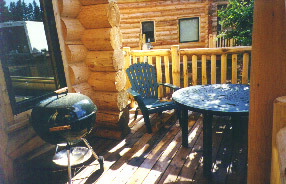 The lodge is on the property and is owned separately. Please do not attempt to charge dinner, drinks, etc. to your bill while visiting the lodge. Parking is free.